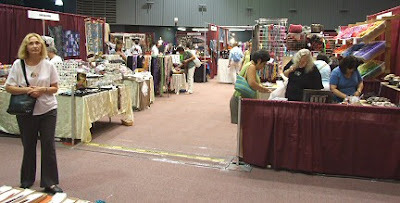 We have returned from our venture to Santa Monica & The Fabulous Fiber Festival of 2007. The show was lovely...loads of wonderful people who came by the booth sharing with us their time & we were blessed with profits for the hungry bank account. Thankfully!! Here's our booth lay out...with Michael pontificating to two interested customers.....wonder what he's saying?? Any guesses? 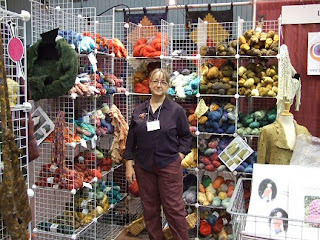 Our booth was positioned right next to Lisa & Rod of Lisa Souza Knitwear & Dyeworks....our good Buds! That was quite a blessing for many reasons! The set-up went well and we were happy with our efforts as we left on Thursday night....ate at Poncho's Tacos on Lincoln.....one of our very favorite haunts when in Santa Monica. Our Hotel was great and we settled in to channel surf on the television.....falling fast, fast asleep. Friday went well....here's a view from the booth of the beginnings of the show on Friday....lots of people came & I even got to help some of them feel comfortable about knitting "their own way". I knit Combination Knitting which is rather different from the way a lot of people knit & I loved being able to pass some information on. By the time that closing came we were all whipped! Michael & I went back to the Hotel...Michael got us Sushi at Chez Ralph's Market...yumm!! Saturday was difficult! I awoke with the left side of my mouth swollen and was in a bit of pain....having been a dental assistant..in a long ago life....I knew that I had an abscess and was "in trouble". Michael held down the fort at the show and I held my cheek...downing ibuprofen until I could no longer take the pain.....I called our dentist at home in Eugene....angels sang and the heavens opened with joy when she said that she would call in a prescription of penicillin and vicodin...can you say AHHHHHHHHH ;)....I went back to the Hotel with pills in hand and flopped down on the bed! Lisa & Rod kindly bringing Michael home to me. Sunday I held court in the van....Michael again held down the booth once again...no one *believe me* wanted to see my swollen face and droopy eyes!! I had visitors...thanks Ladies.....both of my children called me...out of the blue....and I happily knitted in my vicodin stupor...sleeping along the way. It was really quite pleasant...under the circumstances. When it was time to break-down I helped as I felt good enough to do it! 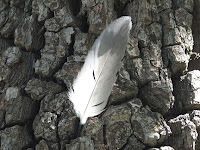 So, My Dears, that's my story...and I'm gonna stick by it! Thanks for sticking by Me!! Ouch! you poor thing. I hope the antibiotics are doing their job and you feel better very soon. What a wonderful thing to have Michael and Lisa and Rod there, not to forget your wonderful dentist! I'm so glad you are home. I hope you didn't knit on something complicated while on meds. The effects can be somewhat - well - interesting at times. Ohhh! Poor Sheila! I hope you are all fixed up now? That sounds terrible. Good to hear you have a husband, friends, and dentist all looking out for you in this painful situation! Yee-ouch! I hope your feeling better, Sheila. The over-40 brain is increasingly phonetic these days it seems. Oh dear. There's not much worse than dental issues, and even worse when you're away from home. What a great dentist, though. I'm glad it was a good show. Oooh, you poor thing! Hope the dentist will be able to fix up your tooth without anything major having to be done. It's bad enough when that happens when you're at home but to be away, must be far worse. What, pray tell have You been UP to?